We are currently completing the introduction of our new service � K-9. This is another exciting idea which I personally wanted to introduce into the country. A couple of years ago, I introduced this service to Sihanouk Ville on a trial basis but was not very successful. Now, we have a different concept. K-9 is basically a police or patrol dog trained specifically to assist our guards. We use them as enforcers. 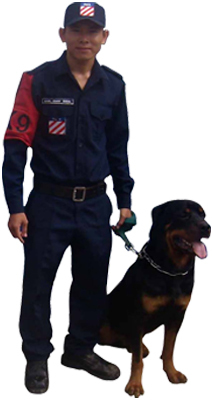 For example, if one of our clients raises the alarm to us we respond with our Intervention Team; which consists of an MPA driver, MPA Supervisor, an armed policeman and the K-9 team.We have three Rottweilers which have been imported from Malaysia but we will also be importing Sheppard�s and Dobermans in the very near future, just as soon as I expand our current kennel. Another reason we use police dogs is that they are ideal for clients who have large locations to secure like warehouses, factories or schools. For this, we propose the K-9 team. This consists of one handler and one dog on patrol. Our K-9 service is already operational. We will also be breeding training and selling dogs for the private market. There is a large demand from both expatriates living here long term and local Cambodians in buying a trained family protector. I have one myself.